The foyer of Isaline is a romantic attic that will charm you, bringing your spirit along the paths of the heart, restoring peace and serenity. The attic is a three-room apartment located on the third floor. The apartment has 5 beds plus a sofa bed and consists of: kitchen, living room, 2 bedrooms, a bathroom, a balcony to the west and a terrace to the east. One bedroom has a double bed and the second bedroom has a double bed and a single bed. The living room has a sofa bed for 2 people. The apartment is in a panoramic position towards Mount Rosa and the Ayas valley. It has a westward exposure to the valley, an exposure to the Monte Rosa chain and to the east. On a private terrace where you can have breakfast in the morning or have an aperitif in the late afternoon. The house has a panoramic terrace, a garden and a private parking. Once you have parked the car, you can get to the ski facilities directly using the shuttle, with free service, which has a stop just below the house. 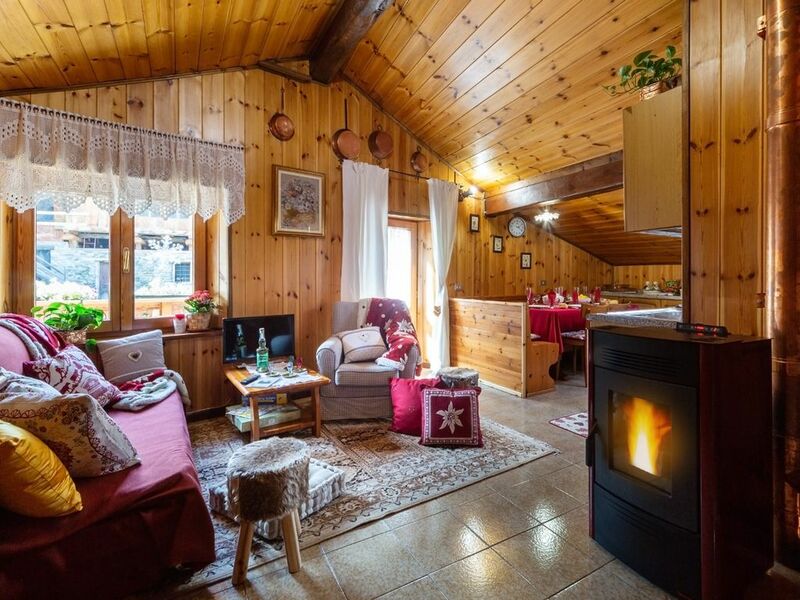 The attic is close to the ski slopes of Antagnod (800 km), to the Monterosa Sky circuit of Champoluc (3.4 km) and to the cross-country ski runs of Brusson, home of the Nordic skiing world championships (2.5 km) . The Monte Rosa Sky ski area connects Champoluc / Frachey / Gressoney-La-Trinité (Monterosa Ski) / Alagna Valsesia is located on Monte Rosa (Italy, Valle d'Aosta) and in Valsesia (Italy, Piedmont). For downhill and snowboarding, 132 km of slopes and 5 km of skiroute are available. 20 facilities transport skiers. The winter sports area is at an altitude between 1. 212 and 3. 275 m. Other winter sports that are practiced along the slopes of our mountains are ski mountaineering, off-piste skiing, snowshoes / snowshoeing or ice climbing. We can organize snowshoeing at night with restaurants reachable only on foot, it is a wonderful experience to reach those villages scattered among the mountains, immersed in the woods with breathtaking views of the mountain peaks, stop for dinner in characteristic restaurants in these wooden and stone houses (rachard) restructured keeping intact all their charm and then down again in the valley in the evening maybe even in motorcycle sleigh. It is possible to practice cross-country skiing in the Ayas and Brusson areas where the World Cup Ski Championships of December 13th 1995 were held. This year the cross-country skiing world championships are still in Valle d'Aosta on 16 and 17 February 2019. Even in summer you can ski on the glaciers of Monte Rosa. In the summer it is also possible to go horse riding or mountain biking among the easiest paths and trekking and mountaineering at high altitude for those who want to do something more challenging; there are also areas where canoeing and rafting can be done. We can organize summer trips along the ancient canals like the Ru d'Arlaz or the Il Ru Courtod. The Ru Courtod takes water from the Rosa's glacier to take it after a good 25 km to Saint Vincent. The peasants continued their work during the summer with regularity for forty years, until 1433, the date of the ratification of the imprisonment by Count François de Challant. Nonostatnte the length of his dislivelo is minimal and the path is also suitable for children. Did you know that in the Valle d'Aosta region of francophone culture a German-speaking community lives? They are the Walser. We can organize with you a journey to discover the ancient German people Walser who in the XIII emigrated from the Rhone on the high pastures of the Ayas valley founding the villages of Frantzè, Soussun, Resy and Saint Jacques des Allemand. the passage of goods between the southern and northern slopes of Monte Rosa at the time was so thick that the territory occupied by the Walser was called, by the Swiss Vallese, Krämerthal, "Valley of the Merchants", almost the Walsers practiced only the trade. The Walser were fine soapstone carvers from which they made pots, containers for seeds and even stoves. They also carved the wood from which apart from agricultural tools such as rastelli, they produced sideboards, furniture and even the famous clogs very similar to the Dutch ones, though less rounded and made with heavier wood. You can visit the ancient gold mines of Chamusia in Brusson, The Chamousira mine Fenilliaz is the most important gold mine in the Valle d'Aosta. The discovery of this mine dates back to 1899 and its history therefore accompanies the modern era of metallurgy in Valle d'Aosta. The mine has an underground extension of about one thousand six hundred meters and had a complex of external installations for the transportation and treatment of the ore. Today the Chamousira Mine Museum is the only museum with an underground visit to the Valle d'Aosta. On rainy days it is possible to organize relaxing days and massages at the Terme di Champoluc. Also in Valle d'Aosta there are also other places where there are thermal baths and we can accompany our guests to visit the thermal baths of Saint Vincent and the most famous ones of Pré Saint Didier. The Valle d'Aosta is rich in history here Hannibal has passed with his elephants and Napoleon with his army. The Valle d'A0sta is rich in castles. In the Ayas valley there is the Castle of Graine before being ceded to the cConti of Challand belonged to the Swiss Monks who once administered these lands. The Aosta Valley is full of castles of the feudal era and it will be a pleasure for us to help and advise our guests to appreciate the countless castles from the most famous of Fenis rich in blackbirds, to that of Saint Pierre that resembles fairies, from that of Verres to that of Issogne, from that of Gressoney to the fort of Bard. the Bard Fort was built to resist sieges in this fort was also shot a part of an Avengers movie. These castles can all be visited and we can accompany you, we can do it also by associating a gastronomic journey of wines, cheeses and typical salami of the valley in typical restaurants. In Valle d'Aosta passes the ancient Franchis road which is still visible and through paved roads and stone bridges leads to the city of Aosta of Roman origin. In Aosta you will find the great Arch of Augustus, you will find the ancient walls and its gates and the Roman Amphitheater. But what you must not miss is the Ancient Roman Forum completely restored and visited, it is near the Cathedral, accessed by going down some steps and when you will be there you can see the place where the most important exchanges took place is 2 meters below the current height of the city streets with its white arcade built in lowered arches, the Criptoportico Forense is the underground jewel of Aosta. ... We are waiting for you! Nous avons adoré notre séjour à dans la propriété d'Andrea. La région est magnifique et les pistes de ski à Monterosa sont parmi les meilleurs dans les Alpes. Le chalet est joliment décoré et très chaleureux et confortable. Tout était propre et en bon état. Andrea est très attentionnée et vérifiait quotidiennement si nous avions besoin de quoique ce soit. L'appartement se trouve tout près d'un arrêt de bus qui mène dans les stations de ski ce qui est très pratique. Je recommended forcer de séjourner ici et espère y retourner bientôt! J'étais etée très contente de vous avoir eu chez moi. Il a été beau de voir un groupe de jeunes amis qui viennent de différents pays (Angleterre, France, USA) être capable de faire si beaucoup de chemin pour ce retrouver et pour pouvoir passer quelques jours ensemble. Tutto perfetto, casa splendida, tutto nuovo pulito ed in ordine, padroni di casa gentilissimi e premurosi! grazie di tutto! Grazie Massimiliano! È stato un vero piacere avervi avuto con noi; siete una famiglia stupenda. Vi ringrazio di aver lasciato tutto in perfetto ordine. Vi aspettiamo per una altra occasione. A presto!